If you’re looking to add a young Amazon affiliate site to your portfolio, then you might want to take a look at the site I listed for sale this week. It is a seasonal site in the water sports niche, but there are only about 25 pages of content, which leaves lots of room to grow. In fact, you can easily ensure that the site makes money in the colder months by focusing on cold water gear, as well as a few other things that I will share with the buyer. I have another site that overlaps with this niche, so I know from experience to expect around $3K from it in December, assuming that no further work is done on the site. I always build my sites with long-term ranking in mind, so you don’t have to worry about a shady past that will get you penalized in Google. And, yes, I know what I’m doing when it comes to making these sites. 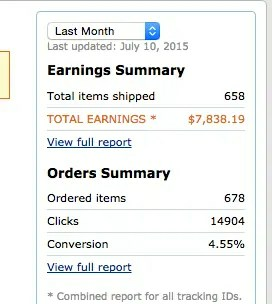 You can see my June earnings from my entire niche site portfolio in the image below. Additionally, I have personally written all the content for the site and I hold a Bachelor’s in English and Journalism as well as an MBA. Three high DA PBN sites are included in the sale.